Early winter view of the outside of Clearbrook 7. Early winter view from the front steps of Clearbrook 7. A stand-alone townhouse at the top of Clearbrook 1. Enter to an outer and inner foyer. From the inner foyer head upstairs to the open-concept living, dining and kitchen area. This level also holds a half bath and accesses the deck. In the living area relax with a fire in the wood burning fireplace while you watch the flat screen television. You can also prepare a meal in the modern kitchen and enjoy it all together at the spacious dining table. Above the main living area is a small sitting loft where you can sit and chat or enjoy a good book. The level above the sitting loft holds the master bedroom suite with queen bed, television and full private bath with jetted tub. On the level below the entry foyer you will find two bedrooms, a full bath and a laundry room with washer and dryer. One bedroom offers a queen bed and television. The second bedroom has two pyramid (twin over full) bunk bed sets and a small television. Robert C from Attleboro, MA does not recommend this vacation rental. Thanks for your comments. The heating system required replacing a few parts, but is now functioning quietly again. The couches have since been replaced, and much small inventory as well. The condo was very clean and we appreciated that there was a bathroom on the main living level. The biggest concern that we had was that there were no railing on the stairs. My friend and I have a difficult time with stairs, so that was a big disappointment. I told the reservation service about it. There were also a few problems that we wrote on our list. If we pushed the kitchen faucet back all the way the water came out and ran across the counter. We also had problems with the remotes in the living room and the queen bedroom. The location was good but I wouldn't want to live there in the winter. The road up to the condo was windy and steep and DARK. We enjoyed our stay and we will probably rent this condo again but we hope that the owner will put hand rails on the stairs. a guest from Plainview, NY does not recommend this vacation rental. The house is situated near the top of the Clearbrook development. The porch does not offer any views and is fairly damp. Overall the property is clean and maintained adequately, but it seems clear that it is only used for rental income. The living room furniture is worn and not really comfortable. There was one sofa (musty) and a futon bed which was not good to lie down down. Seating with guests was limited. The downstairs bedrooms are very damp and somewhat musty smelling. Upstairs bedroom furniture is comfortable. No AC - this is not generally a big deal, but with the summers getting hotter in general, this is important to note. Is has god ceiling fans on the main and master bedroom levels, which help. Carpets are well worn and have some stains. Lighting is so-so. The main level has a dining room table that looks like a fake spanish castle. The chairs are not comfortable for general use. We crammed in at the service counter to avoid using the table for meals. Overall - this is an OK property, but there are many nicer homes that we have rented over the years and would not recommend this one. 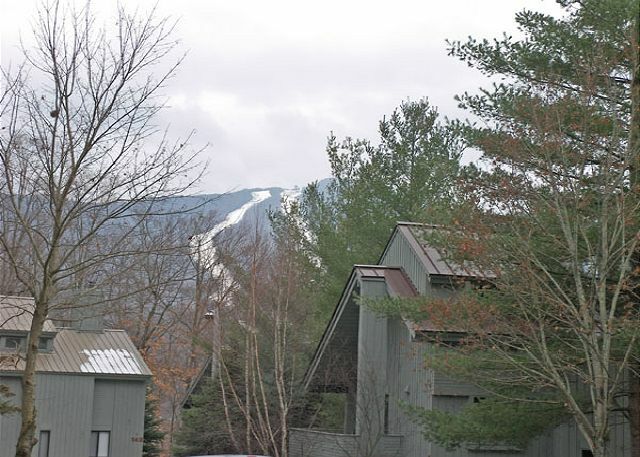 We had plans to ski/relax at Loon the week following MA February vacation. We had a fabulous experience staying in Clearbrook 7. The only problem was a non-functioning can-opener which was resolved with a leatherman. The space was ample for friends early in the week and family at the end of the week. The kitchen was very well stocked and the laundry room was wonderfully convenient. Our well behaved dogs and cozy fires made the place feel like home after a day on the slopes and all day the one day it rained. Conditions at Loon were awesome in the am then light granular as temps climbed in the afternoon. Sun made it feel like spring! We enjoyed access to the pool, sauna, hot tubs. House was very spacious we really liked it. It was a separate condo so it was nice to have privacy. The only thing that needs updating are the shades and the family room furniture. Lots of the shades are broken and the furniture is worn and uncomfortable. o.m.g. what a great house ! for a family get away. Went for a ski trip at loon. Condo was large and clean and more renovated than expected. Very nice! overall enjoyed the stay. condo could use some tlc, replace inside and outside light bulbs, some window blinds broken etc. But very spacious and worked our great for our family, kids friends and dogs. So easy and accomodating! Can't wait to go thru the service again! Had a really good time-wish there had been some wood for the fireplace but was able to find down the road-however, could not find receipt and therefore could not be reimbursed-but was nice to be close to the mountain and the condo was in very good shape-great for family gathering. Thank you. very enjoyable, however I woul like to point out 2 things. the venetian blind in the living room facing the front needs to be fixed. Ski vacation at Loon Mountain. Even though the weather was not ideal for skiing/snowboarding, the mountain did an amazing job at making snow and we had a fabulous vacation on and off the mountain. Loved that it was a detached condo so there was no neighbors on the other side of the wall. We went for a ski trip with my 2 kids and their spouses. The location was convenient to the mountain and close to restaurants and the town. The main living space was spacious so there was plenty of room for the family to be together and play games at night. The only drawback was that there is only one shower. This made for longer preparation time in the morning before leaving. If you have small children that like to swim you will need to drive to get to the pool. Clean place with large living space, the kitchen was well equipped and everyone slept comfortably. I love that no one else rented the units next to it and that we basically had the whole street to ourselves. Would recommend to anyone! The condo fit our needs perfectly, even though we lost power for about 20 hours and had to eat out more than expected. Kids loved the bunk beds and everyone had a great time. We had a wonderful time staying at Clearbrook 7. This location is close to everything. We enjoyed eating at Gordis, went to the Flume, the Basin, shopped, and much more. The house had everything we needed. We even forgot an item and they mailed it to us right away. The place was very clean and comfortable. We loved that it was pet friendly also. Thank you so much for a great stay and we look forward to many more! Glad that you enjoyed it so much. We look forward to seeing you again! Lovely house with open living spaces, convenient to Loon. Comfortable beds! Pleasant people to work with. Very responsive and helpful. I do wish checkout was at 11am, not 10am. In addition to affording us more time to relax before loading the car, it would also allow us to wander into one of the nearby restaurants for lunch before we left town. Glad you enjoyed your stay so much you'd like to stay longer! :) If a home is not being occupied again on the same day, we are often able to extend checkout till noon. Just check with us during your stay next time. Location was great! It is a short ride to downtown Lincoln / Woodstock, and just 32 miles to Conway. Overall a nice place but like most of these rentals, could be so much better with a fresh coat of paint and replacing the well worn uncomfortable living room furniture. There was no wood provided or available anywhere on site for the fire place. Upon arrival the entry stairway light bulbs were burnt out. I replaced them myself the following day with bulbs given to me by the office. It would have been especially nice to have the upstairs bedroom suite available especially with 4 adult guests instead of adults having to sleep in bunk-beds. I understand most renters do not cook in, but we do and it was difficult not having a half decent set of pots and pans. I am not asking for a gourmet kitchen set up, but a frying pan that sits flat on the stove top or a pot big enough to boil pasta would have been nice. We're glad that you enjoyed the home enough to request it for next year. We did speak with the homeowner about your concerns as well. The Clearbrook 7 unit was great. The unit was clean and well maintained, it was very spacious for our group and our dogs, and the proximity to Loon was perfect for us to enjoy the Oktoberfest festivities. The staff was also very helpful with the check in/out process, very pleasant to speak with when I had questions, and made the weekend as enjoyable as possible. Nice condo with plenty of room to spread out. Very clean. Glad that you were able to enjoy your stay here! Everything was great, my only complaint is that the check in office was closed early on Friday before I got there as did not open until after the ski mountain did Saturday morning so I was not able to get to the mountain as early as I would have liked to because I had to check in. We're glad that you enjoyed your stay. We do ask you to stop by the office to complete your check in, and so you can pick up a pool pass, etc. but it's ok to do that after skiing. We're open 9am to 6pm, seven days a week. Great winter getaway near Loon! We were very satisfied with the condo. Great location and had all the amenities. Would definitely recommend it! The staff was courteous and helpful. The condo was clean, spacious, well equipped and in a quiet location. A gift bag with a packet of coffee, creamer, sugar and a packet of microwave popcorn made us feel welcomed. We stayed only 3 nights and wished it could have been longer. We enjoyed the use of the swimming pools just down the road at Village of Loon Resort and we took advantage of their picnic area with grills for a cookout. We plan to stay here again! All of the amenities you'd need....very nice vacation spot! We're happy that you had a nice vacation and enjoyed the spot! We had a a wonderful time in this beautiful home. Lots of room. Everything we needed for operating in the kitchen. Bedding, pillows and towels were very clean and fresh. Excellent place to stay. Perfect weekend get away place!! Thank you for your kind words. Glad you had an excellent time! Awesome rental..immaculate, beautiful view, comfortable. We had a great time to stay at Loon for 3 nights for the past weekend. Even my dog made some friends in the neighborhood :) The only drawback is the check out time is too early @10AM. We will like to come back again! We're glad to hear that both you and your dog had a great time! If there is the option for a later check out, we will gladly provide it. We just cannot do it when someone else is arriving the day of your departure. we had a great time, the home was wonderful, and the fact that we were able to bring our two small dogs, made it even better! Very nice, quiet location for our family. Condo was more than adequate, although property owner may want to fix some of the water damage before it becomes a problem. Glassware, plates and silverware were all present in plenty. No problems having to wash a glass just to get a drink. I'd rent the same unit again next year without hesitation. Property was very well maintained and very clean. clearbrook resort is a very nice resort, we stayed all the way up on the top of the resort. we had nice weather and a very peaceful stay. thank you to loon reservation service for suggesting this place for us to stay. Located at the top of the hill, the property was private but a bear to bike up! Very clean, except there was some hair in the tub. Kitchen was well stocked. We would definitely go back. We were very happy with our stay at the Clearbrook 7 Condo. The place was clean, roomy and well equipped. The rental agency was helpful and responded quickly when we had trouble working the TV (though the person who responded also couldn't figure it out). Our only complaint was that the shuttle to Loon was not running on Friday although we had been told it would be. This resulted in a long, fruitless wait for a bus.